WHAT REALLY HAPPENED TO ABACHA AND ABIOLA? General Olusegun Obasanjo and over 50 other army officers were in jail on trumped up charges of coup plotting. Nigeria had become a pariah nation after being expelled from the Commonwealth for executing Ken Saro-Wiwa and other activists who were campaigning for a fairer share of Nigerian oil revenues and against the environmental damage caused to their lands by the drilling and spills of big oil companies. Lt-General Oladipo Diya, Major-Generals Abdulkareem Adisa and Tajudeen Olanrewaju, and several other officers were on death row awaiting execution for their role in another coup plot. The winner of the acclaimed June 12 1993 election Chief MKO Abiola had been in jail for 4 years, kept incommunicado from the outside world. General Abacha was on the verge of transforming himself from a military ruler to civilian President having strong armed all the 5 political parties (“five fingers of the same leprous hand”) into adopting him as their presidential candidate. Genuine democracy seemed far, far away. Plus a lot of the “pro democracy” activists shamelessly abandoned Abiola to join Abacha (Olu Onagoruwa, Baba Gana Kingibe). Even ministers in Abacha’s regime were not safe. The Guardian Newspapers (owned by Abacha’s minister Ibru) was proscribed by a newspaper proscription Decree and shut down after it criticised the government. It was the paper’s continual criticism of Abacha’s regime that led to the near fatal assassination attempt on Ibru. On June 8 1998 Abacha dies of a heart attack and is hurriedly buried without an autopsy by the time the news filters through to most Nigerians. Nigerians publicly celebrate the death of a reviled leader with wild jubilation. General Abdulsalam Abubakar quickly replaces Abacha and announces that Abiola will be released but that he had to realise that his mandate had expired. A lot of chicanery was used to get Abiola to renounce but he refused. UN Secretary-General Kofi Annan is sent to talk to him and explain that his “term of office” had expired since 5 years had passed since the June 12 1993 election. All to no avail. 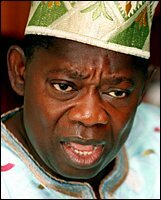 Exactly one month after the death of Abacha, Abiola suddenly dies of a heart attack on July 7 1998. With Abacha, Abiola and the June 12 issue out of the way, General Abubakar announces a swift 10 month programme for a return to civilian democratic rule. Just 10 months after Nigeria seemed doomed to perpetual military rule under General Abacha, the military steps down and a new democratic government is elected under President Obasanjo. The speed with which Abacha’s infrastructure was dismantled just seemed too contrived. With Abacha alive and Abiola incarcerated, most people thought democracy was years away in Nigeria. Just 10 months after his death everything he did was undone: his killer squad was dismantled, coup convicts and pro democracy activists released, Nigeria back in the Commonwealth, democracy restored, and the army back in the barracks. Note that a lot of Abacha’s cronies survived in office and resurfaced in subsequent dispensations (Sarki Mukhtar – NSA, Jerry Gana etc). Somehow exactly 30 days apart, both men die of heart attacks. Abacha is prevented from becoming a civilian ruler, from executing the condemned men like Diya, Adisa and Olanrewaju, and a recalcitrant Abiola (who refuses to renounce his mandate) also dies. Problem gone, debate over, fresh start. All rather convenient isn’t it?…. How easily we forget…. This is another series of documentaries on Biafra. Produced by Nigeria’s own NTA, these videos feature interviews with the key players such as Gowon, Ojukwu, Babangida, Maj-Gens Mohammed Shuwa, Adeyinka Adebayo, Godwin Abbe, George Innih, and David Ejoor, Brigadiers Samuel Ogbemudia and Mobolaji Johnson, plus civilian participants like Philip Asiodu and Ahmed Joda who were key players in the abortive negotiations prior to the war. Of great vintage is the footage of the Aburi debate in Ghana in 1967. Amazing footage of Ojukwu chatting with Gowon, Hassan Katsina, Commodore Joseph Wey and other members of the federal delegation to Aburi. These videos are condensed videos from an excellent 1995 Channel 4 documentary (called “Delta Force”) on the Ogoni oil crisis. It aired a few days after Saro-Wiwa was executed. These videos cover the conflict over oil and natural resources between big oil companies, the Ogonis and the then ruthless military government in Nigeria. The videos also feature footage from the Civil Disturbances Special Tribunal which sentenced Saro-Wiwa to death.